FINAL UPGRADE SUPERB VINYL!! BET YOU CANT FIND A BETTER COPY! GENUINE 1ST UK PRESSING LP WITH EARLIEST MATRIXES / PINK RIM LABELS / PINCHED SPINE / TEXTURED INNER ETC. RELEASED 45 YEARS AGO IN 1973 AND PURCHASED NEW BY ME BACK IN THE DAY. ISLAND RECORDS CATALOGUE NUMBER ILPS.9230 AND 1ST UK 'SARK' PRESSING MATRIX NUMBERS A-2U AND B-2U. THIS IS THE ORIGINAL 1ST UK PRESSING.THE VINYL IS GLOSSY AND BRIGHT AND IN NEAR MINT CONDITION WITH NO SCRATCHES/SCUFFS /FINGERPRINTS VISIBLE WHATSOEVER-IT LOOKS LIKE NEW. THE PINK RIM PALM TREE LABELS SHOW ONLY FAINT SPINDLE LINES PER SIDE SO GRADE AS IN NEAR MINT CONDITION. THE SLEEVE IS IN EXCELLENT PLUS CONDITION WITH ONLY SOME VERY VERY MINOR SHELF WEAR AND HAS ITS ORIGINAL TEXTURED INNER LYRIC SLEEVE WHICH IS IN EXCELLENT CONDITION. THE SPINE WITH PINCHED ENDS IS EXCELLENT PLUS. A RARE OPPORTUNITY TO OWN AN ORIGINAL 1ST UK PRESSING IN NEAR MINT / EXCELLENT PLUS CONDITION!!!!! SEE MY OTHER ENO AND KING CRIMSON AND RARE AND INTERESTING AND 60's/70s/80s/90s ALBUMS LISTED! REALISTIC START PRICE AND NO RESERVE. THE PHOTOGRAPH SHOWS THE ACTUAL DISC YOU WILL RECEIVE IF YOU WIN THE AUCTION. READ MY FEEDBACK AND BID WITH CONFIDENCE! GOOD LUCK! POSTAGE IS FREE TO MAINLAND UK OR £4 BY TRACKED MAIL (I RECOMMEND TRACKED MAIL FOR ANY ITEM OVER £20). POSTAGE CHARGES TO EUROPE/EASTERN EUROPE AND RUSSIA ARE £12 FOR TRACKED DELIVERY. POSTAGE TO ITALY AND RUSSIA IS BY TRACKED DELIVERY ONLY. I ALWAYS COMBINE POSTAGE AND WILL POST WORLDWIDE BUT INTERNATIONAL BIDDERS FROM OUTSIDE EUROPE/RUSSIA PLEASE NOTE THAT POSTAGE CHARGES ARE HIGHER TO YOUR COUNTRIES-PLEASE ASK. NEW VINYLS LISTED FOR AUCTION DAILY!! I ALWAYS POST OUT DAILY AND WITHIN HOURS OF RECEIVING PAYMENT BUT SOME COUNTRIES TAKE LONGER TO COMPLETE DELIVERY (IT CAN TAKE UP TO 6 WEEKS IN RUSSIA FOR EXAMPLE) SO PLEASE BE PATIENT AS THIS IS OUT OF MY CONTROL! GRADING VINYLS AND COVERS WHICH CAN BE UP TO 50 YEARS OLD IS A VERY SUBJECTIVE PROCESS. I USE THE RECORD COLLECTOR SYSTEM . EXPERIENCE AND FEEDBACK TELLS ME THAT MY GRADINGS ARE FAIR AND ACCURATE BUT IF YOU DISAGREE WITH MY GRADING THATS FINE - JUST CONTACT ME BEFORE LEAVING FEEDBACK AND I WILL ALWAYS RESOLVE ANY PROBLEMS TO YOUR SATISFACTION!! 100% GUARANTEED! A GENUINE 1ST UK PRESSING VINYL IN SUPERB CONDITION!! LOW (BRAVE)! START PRICE AND NO RESERVE!! 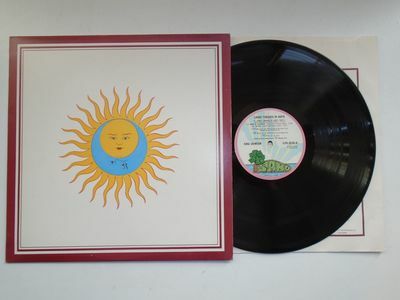 SEE MY OTHER FANTASTIC ENO AND KING CRIMSON VINYLS FOR AUCTION.